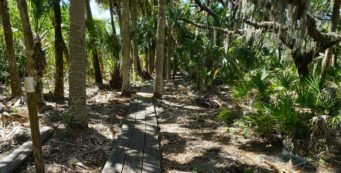 Blueberry Picking in Florida | Florida Hikes! It’s blueberry season in Florida! As hikers know, we’re fortunate to have a bounty of blueberries across our state in our wild places, but they don’t start maturing for another month. 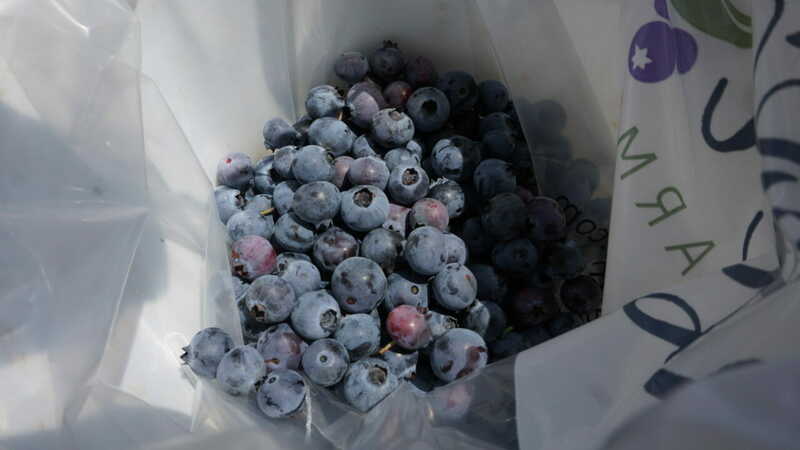 But you can get a jump on these tasty treats by heading to one of our many blueberry growers around the state. There’s no excuse for store-bought when Florida has a bounty of fresh blueberries available. Blueberries start ripening down in Homestead in December, and the season sweeps north from there, all the way up the East Coast. 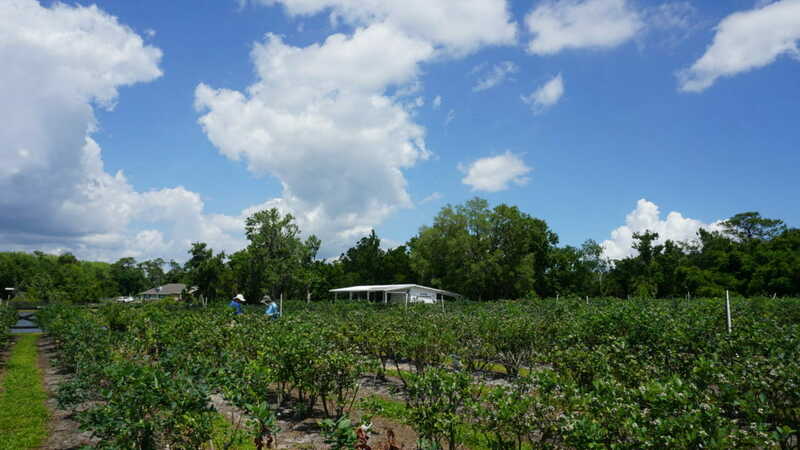 As we travel, we’ve noticed some clusters of farms in certain regions of Florida. You’ll find a bunch of them near Ocala and Gainesville, between Monticello and Tallahassee, and between Brooksville and Inverness. But they are, indeed, scattered everywhere. Since wild blueberries grow well in so many of our habitats, it makes sense that highbush blueberries flourish in the same soils. 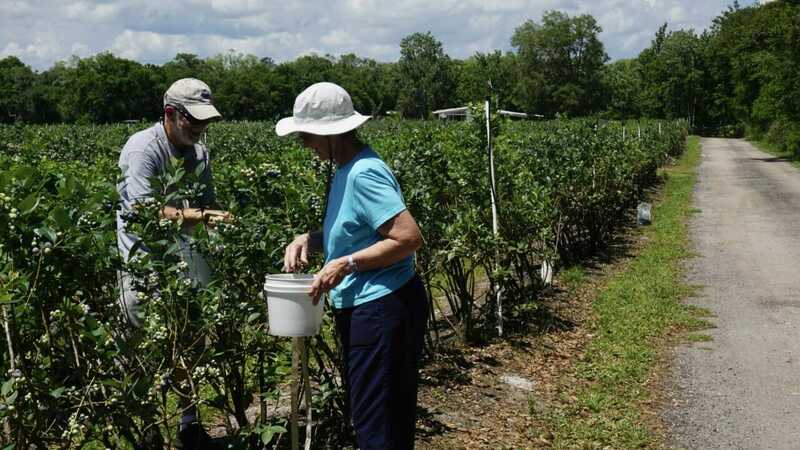 Mid-April through May is the hot time for picking your own blueberries at Florida’s blueberry farms, after commercial growers have already harvested much of their crops. Most farms with U-Pick stay open until they run out of berries, and then that’s that. Fortunately, that’s when our wild blueberries ripen! 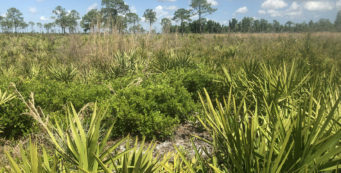 While it’s not the nicest time of year to go hiking, early morning forays on trails into scrubby flatwoods will net you blueberries, just not in the poundage you’ll find at a farm. Since we drive down US 1 a lot, we see the signs go up along the roadside when the farms in North Brevard County are ready for visitors. 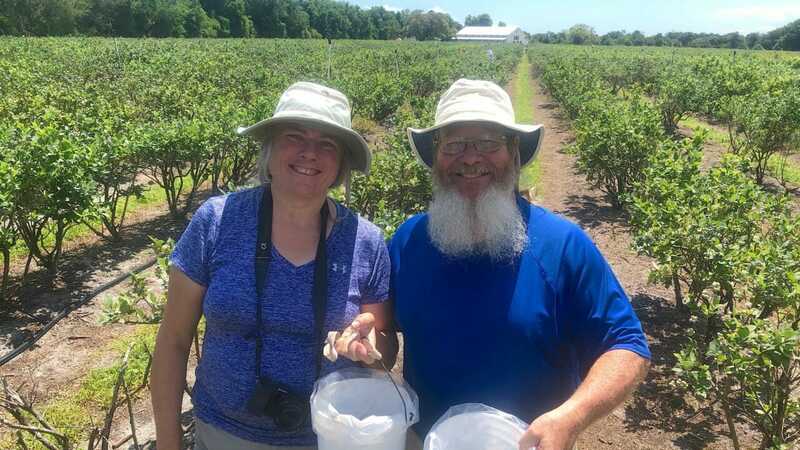 Last week, we saw the sign for Ever After Farms and, since the timing worked out to introduce our visiting friends to berry-picking in our own backyard, we headed over to see what berry picking in Brevard was all about. We’d noticed Ever After Farms on our bike rides up the Coast to Coast Trail, since it’s hard not to notice a princess carriage parked next to a barn. In addition to being a blueberry farm, they are a wedding destination all year long. We picked up our buckets at the front gate, where the gentleman explained that you could use the strap to sling it over you so you could pick with both hands. He also pointed out the colored stakes at the start of each row: yellow, green, and blue. 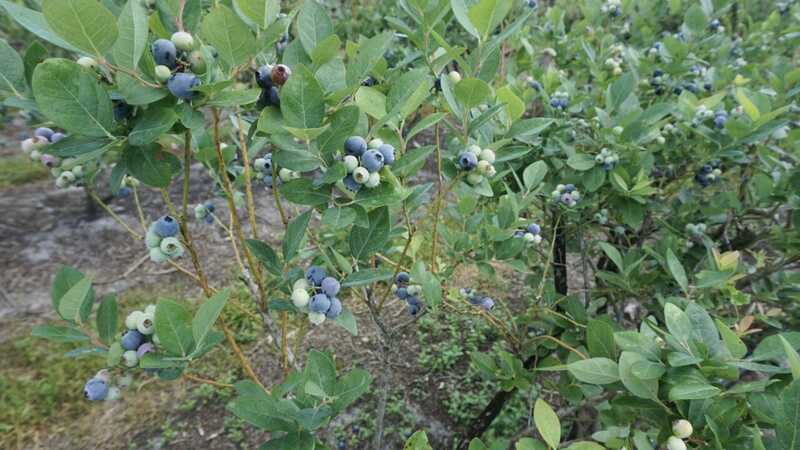 They corresponded to the types of blueberries planted in those rows and their relative sweetness. John and I dove into the near fields, taking time to chat with other pickers around us. Although it was a Friday, there were parents with their kids, and visitors of all ages. After picking for a while, I noticed our friends Linda and Jerry were nowhere to be seen. I kept walking until I spotted them halfway down the fields, exactly where the fellow up front had recommended going. We found berries everywhere, of course, but Linda was delighted that there was a bonanza of big berries in this area, as promised. When my bucket grew heavy, I started walking back to find John. Together, we discovered that the gate to the Coast to Coast Trail was open, and a sign out encouraging cyclists to stop and join in. The farm is just south of Mile 7 on the Coast to Coast Trail. Even if you ride up without a bike bag to haul away some berries, you can stop in for a cold blueberry lemonade and a snack, since they sell pre-picked berries too. When we checked out, we discovered that our two almost-full buckets netted 8 pounds. In the same amount of time, Linda and Jerry had to get an extra bucket. They ended up with 11 pounds. We think they were using the two-handed technique, because we weren’t. It’s also the time of year for competing blueberry festivals across Central and North Florida. The Official Florida Blueberry Festival has already come and gone, but that doesn’t mean you can’t find another. 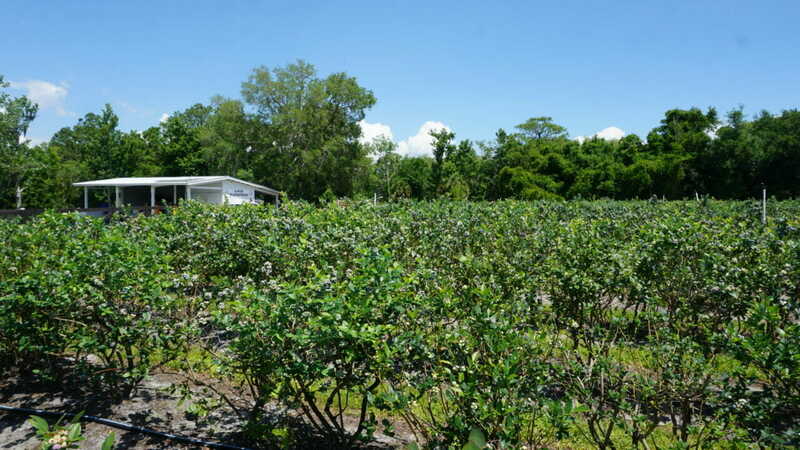 The last weekend of this month is the Brooksville Blueberry Festival. Both of these events feature concerts and draw a lot of people. Show up at one, and blueberries are guaranteed. There’s nothing like fresh blueberries! 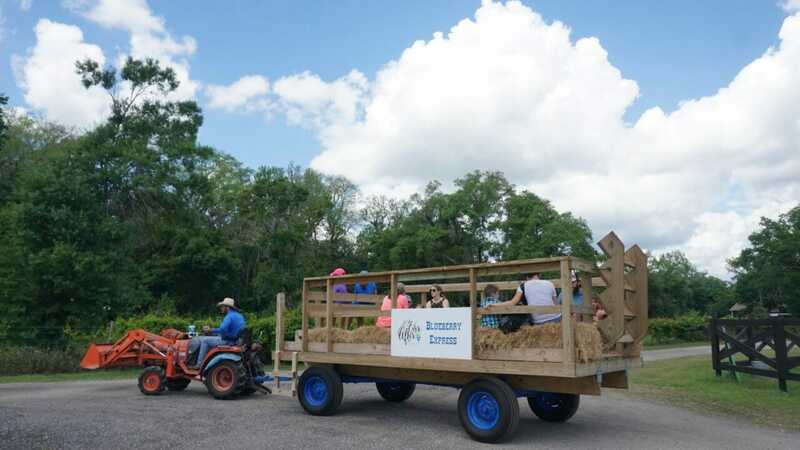 Small towns like Bronson (in Levy County) and Island Grove (near Cross Creek in Alachua County) hold smaller festivals, more down-home in nature, with bake sales and garage sales and of course, lots of blueberries. Among these, Wellborn, a small community northeast of Live Oak, has been hosting the Wellborn Blueberry Festival for as long as I can remember. They’re the last one of the season, usually the first weekend in June. 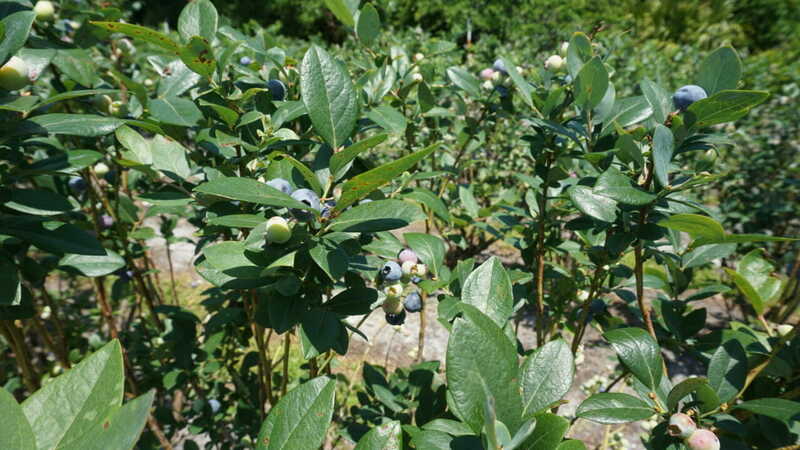 We enjoyed picking blueberries and we bet you will too. 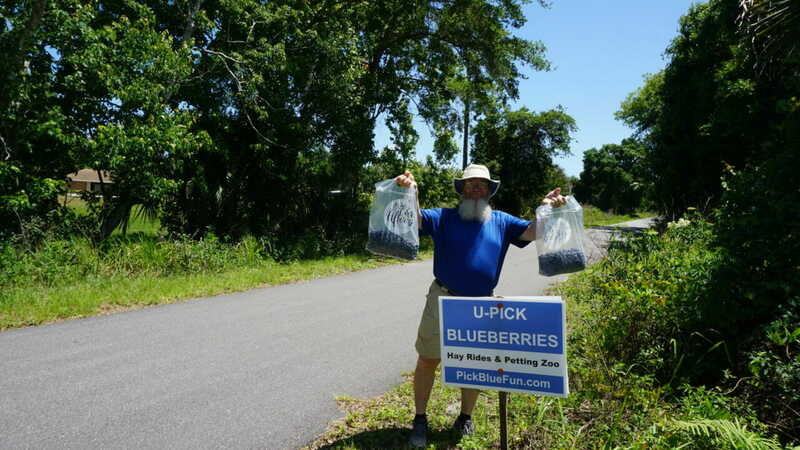 To learn more about where to find U-Pick blueberries in Florida and blueberry festivals around the state, visit the Florida Blueberry Growers Association. 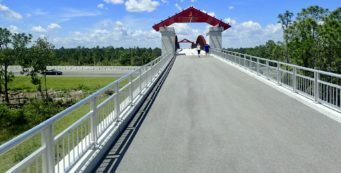 The southernmost farm they have listed is near Arcadia, and the northernmost is near Panama City. Our local farm is Ever After Farms. They have a sign out on US 1 at Burkholm Rd north of Mims. Follow Burkholm to Shamrock and make a left. 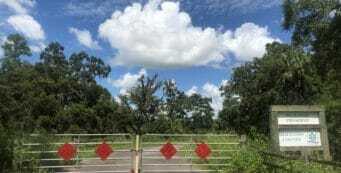 Make a left at the T. The road ends at their farm at 4400 Bouganvilla Dr, Mims. They are closed Mondays, open Tue-Thu 9-6, Fri-Sun 9-2. Once the berries are gone, the sign will be, too.